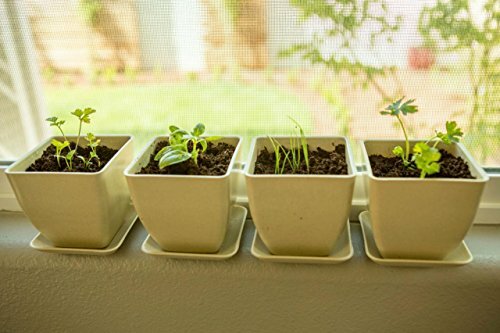 Herb Garden Starter Kit - Indoor Herb Garden Growing Kit Includes Organic, Non GMO Seeds; Basil, Parsley, Cilantro and Chive, Compact Soil Discs, Reusable Bamboo Fiber Pots and Plant Markers! Growing your own herbs, vegetables, fruits and gardens are fun, easy and can give you and your family great satisfaction all season long! 4 High quality organic seed packets; Parsley, Cilantro, Chive and Basil. 4 White Bamboo Fiber Flower Pots with Saucers. 4 Plant Herb Identified Plant Markers for easy labeling of your seeds. GROW FRESH HERBS IN REUSABLE BAMBOO POTS. Enjoy growing fresh Parsley, Cilantro, Chive and Basil as an indoor herb garden or outside herb garden. These bamboo fiber flower pots are made to last and are super durable! The pots are 3.5" tall and 3.5" wide at the top. They are biodegradable, sturdy, eco-friendly and safe! They will keep your soil moist so it doesn't dry out quickly like peat pots do. NUTRIENT DENSE SOIL. Our herb garden starter kit includes 4-water activated, compact soil discs for your seeds and will expand to 9 times their size. The soil provides essential nutrients like; kelp and worm castings to help develop a stronger root system, faster germination, and enhanced plant growth! Made in the USA. NON-GMO, ORGANIC, NON-HYBRID, HEIRLOOM SEEDS. What does all that mean? It means your seeds are original varietals, nutrient packed herb seeds with an 85% guaranteed germination rate provided to you by our master seed partners, farming and gardening experts. All Sourced in the USA. GREAT GIFT OR FOR NEWBIE GARDENERS. Complete with all the elements for the perfect gift! Our herb kit is excellent for new homeowners, apartment dwellers, kids, novice gardeners and everyone in between! 100% SATISFACTION GUARANTEED. The Sprouted Gourmet guarantees you'll love it or we'll send you your money back. If there is any problem with your herb garden kit or you are less than satisfied, let us know. We will refund your money; no questions asked! If you have any questions about this product by The Sprouted Gourmet, contact us by completing and submitting the form below. If you are looking for a specif part number, please include it with your message.